Alaska Software has investigated into an issue in the SMB2 protocol as used under Windows Vista, Windows 7 and Windows Server 2008. This issue can lead to data loss or corruption in files shared in network environments. We have set up a dedicated web page explaining the details. The web page also provides access to an MSI package to configure workstations so that data corruption no longer occurs when using SMB2. Although Alaska Software has tested this approach in its labs and with some customers, we would like to encourage all of the Xbase++ community to send in as much feedback as possible related to this subject matter! Specifically, we are eager to know whether the package provided safely resolves the SMB2 problem, and whether it is suitable for usage at your customers' sites. Please send any feedback or question related to that issue to support@alaska-software.com. Thank you very much upfront. Did you know that in 2009, Alaska Software has begun releasing so-called "Xbase Part Packs" to its Subscription customers? Are you aware that each Part Pack contains one or more new Xbase Parts, ready to be used in your applications? But the Xbase Part Packs contain more than just a few visual controls! Each Xbase Part comes with full source code, which provides in-depth information on using advanced features such as owner-drawing, or on creating new Xbase Parts using the windows API. Also, all parts can be used within the Xbase++ FormDesigner. Thanks to the new extension model added to the FormDesigner with SL1. First Part Pack: Contains extended tab page and push button classes with flexible text & image captions and formatting options. 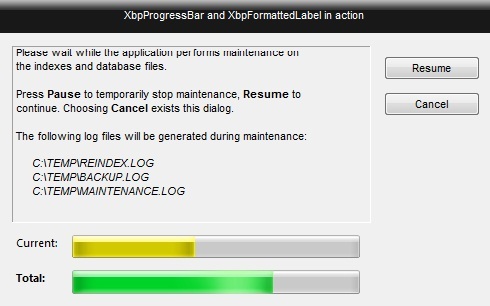 Xbase Part Pack #2, sample showing new progress bar and label classes. Second Part Pack: Contains a platform-compatible progress bar class and an extended XbpStatic class with various text formatting options. And the next part pack is already in the works...!! In accordance with our Product Maintenance Policy Hotfix-Rollups #42 for Xbase++ 1.90 SL1 has just been released. This Hotfix Rollups provides a correction for the ASINet (Internet Library). Be reminded, that all Hotfix Rollups should only be applied, if there is definetly a need for them, having observed problems and/or issues as outlined in our PDR description. We would like to ask our customers for a little more patience, but we are convinced that with the technical foundation we are laying with Arctica, any Xbase++ developer can save a tremendous amount of money and time in the future while preserving existing investments. Customers with an active subscription can join the arctica newsgroup, which is monitored by Alaska Software as of today. Customers are invited to ask any kind of Arctica-related questions. This newsgroup will also be used as the platform for the Arctica preview. Just use your customer account login credentials for your newsreader, or login at news.alaska-software.com . In accordance with our Product Maintenance Policy a series of Hotfix-Rollups for Xbase++ 1.90 SL1 just has gone online. The Hotfix Rollups #39 - #41 cover various issues related to the SDFDBE, ADSDBE and ODBCDBE DatabaseEngines. As always, we would like to remind our customers to download and apply Hotfix Rollups only in the event they are observing one of the issues as outlined in the related PDR description. In accordance with our Product Maintenance Policy a series of Hotfix-Rollups for Xbase++ 1.90 SL1 just has gone online. The Hotfix Rollups #35 - #38 cover various areas of the Xbase++ product. As always, we would like to remind our customers to download and apply Hotfix Rollups only in the event they are observing one of the issues as outlined in the related PDR description. The second Xbase Part Pack is available for download. It includes the classes XbpProgressBar and XbpFormattedLabel. The former implements a platform-compatible progress bar class based on the corresponding Windows control. XbpFormattedLabel extends the XbpStatic class by adding various text formatting options. Note that an updated version of the Xbase++ form designer is required for using this Xbase Part Pack. This version is also available under Downloads->Solutions, and must be installed on your computer. Please note that enhancements on the form designer were made since the release of Part Pack #1. Please make sure that the latest version is being used with this Part Pack. Today, the Web Application Adaptor V.1.90 SL1 has been made available for download. This release is based on Xbase++ 1.90 SL1 and covers PDR 4926 , 5724 and 6063 . The WAA is available for all active Xbase++ customers. Hence you need simply log onto your Alaska Software account. The installation package then can be found under MyAccount -> Download -> Latest Releases. Furthermore the WAA Online Documentation in HTML Help format can be found under the same download location. This may be of special interest to of you, whose operating system is Windows Server 2008, Windows Vista or Windows 7, since there the Win32 help format is not seamlessly supported. Additionally a tutorial is available for download. This paper is targeted to WAA novices and explains in great detail the required steps to setup and configure the IIS7 Web Server and WAA server. After working through this document, the sample applications are ready to run and your environment is ready to begin development. The tutorial can be found under Login -> MyAccount -> Download -> Documents. This fall, Alaska Software will organize / conduct its first Xbase++ Roadshow. Designated locations shall be Denver, USA on the 11th of October 2010 and Frankfurt, Germany on November 22nd. Given the experiences made and the feedback received, going forward we might expand the list of locations. Therefore Alaska Software wants to inform its customers at the earliest point in time possible to ensure that everybody involved and/or interested in Xbase++ will earmark these dates and locations upfront. The Xbase++ Roadshow has a single goal: To provide existing Xbase++ users first-hand information about current and future technologies available in Xbase++. In addition, we might include a dedicated Xbase++ introductionary presentation for those of you, who do not yet use Xbase++. The Xbase++ Roadshow is therefore the way to get an idea about how to make use of existing, new and forthcoming features of the Xbase++ platform. New community members will get a basic introduction into the Xbase++ platform and its capability to modernize existing Clipper, dBase, FoxPro or Visual FoxPro applications. Attending any Xbase++ roadshow event will be free of charge; beverages, lunch and snacks will be complementary. More detailed information will be published in due course. In accordance with our Product Maintenance Policy a series of Hotfix-Rollups for Xbase++ 1.90 SL1 just has gone online. The Hotfix Rollups #29 - #34 cover various areas of the Xbase++ product and the Professional subscription content. As always, we would like to remind our customers to download and apply Hotfix Rollups only in the event they are observing one of the issues as outlined in the related PDR description. The description of our Support and Service offerings got revised. This aims to clarify which type and level of support Alaska Software provides depending upon the products registered. Hereby, we would like to draw your attention to the fact that regardless of which product you have purchased, Getting Started and Installation Support is included for a period of 12 months starting at the day of purchase. Potential customers who have downloaded the Xbase++ trial version are automatically entitled to receiving 30 days of free Evaluation Support which also includes, if required, migration advice. Problem Resolution Support is provided only to customers who have an active subscription product with support services registered. For more details, please be referred to our Support & Service Policy . Also, we would like to remind our customers to take a look at our Product Maintenance Policy . In accordance with our Product-Maintenance-Policy a series of Hotfix-Rollups for Xbase++ 1.90 SL1 just has gone online. The Hotfix Rollups #25 - #28 cover approximately 20 corrections mostly related to the Windows 7 platform. When downloading HR #28 please make sure to select the edition (International or German) which matches your product.